What am I learning from my Stashdown, well sometimes liking and wanting aren't really the same thing. Not every yarn needs to come home with me. It might be better if I leave some yarns which don't work with my overall knitting plan wherever they already happen to be. 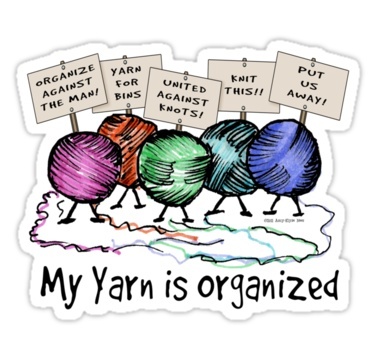 You can never go wrong with good basic yarns. I should donate more of what I don't want rather than try to force it. I did realize startitis is often a message from your unconscious it's time to let something go. The thought that someday someone else has to deal with all that yarn if I don't is becoming much more disturbing. On the positive side I really do have some lovely yarns to keep me busy for the next while between design projects. I truly love the design challenge of making something great from what's turning up while I'm sorting through the stash. See my post here on what I've been doing.